A group of Batley Bulldogs officials and supporters are planning a sponsored cycle ride to Blackpool ahead of the Big Bash next month. The group will be led by Rob Earnshaw and Andrew Dart as they plan a two-day ride to Blackpool over May 22 and 23 ahead of the Heavy Woollen derby against Dewsbury Rams on May 24. The club are asking people to sell sponsor tickets at £2 each, to be entered into a prize draw, with money raised going towards the project to buy an electronic scoreboard at Fox’s Biscuits Stadium. The draw will be made at the home game against Sheffield Eagles on June 7, which the Bulldogs are planning on dedicating to former club stalwart Ron Earnshaw. Batley have previously organised a sponsored walk to Leigh and a cycle along the Leeds-Liverpool canal in a bid to raise funds for essential ground improvements. 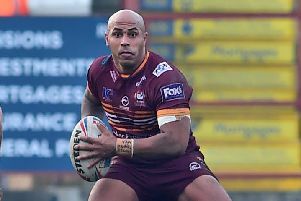 Batley have set a £5,000 target for the scoreboard fund and supporters club members who travelled to the Easter Monday game at London made donations. These efforts were doubled by Fred and Barbara Crossley with the efforts raising £360. Donations from supporters Marion and Keith Brook, Bert Wales, George and Mary Gomersal and Mary Hughes further boosted the fund. Heinz Adler and his family travelled from Switzerland to attend last Sunday’s game against Featherstone and donated a further £200. Peter Collinson is a sponsor of the club and attended the Rovers match from Marske in the North East, when he agreed to pledge a further £1,000 to boost the coffers towards the scoreboard fund. Gwyn Whitely’s weekly raffle raised a further £176 and took the current efforts beyond the £2,000 mark. Further details on the fundraising efforts are available from Paul Harrison at the club. n Batley Bulldogs are hosting a comedy night in Ron’s Lounge at Mount Pleasant next Friday (April 24). Doors open at 7pm and entrance is by ticket only at a cost of £10. Supporters will be entertained by four comedians on the night but the event is restricted to 120 people and is expected to sell out.